› Author AffiliationsWe are grateful for grants from the National Natural Science Foundation of China (Nos. 21262008, 21502240 and 21861009), the Natural Science Foundation of Guangxi Province (Nos. 2018GXNSFAA281317, 2016GXNSFAA380178 and 2018GXNSFBA138032) and the Guangxi University of Chinese Medicine Research Foundation for introduced PhD (No. XB017027). 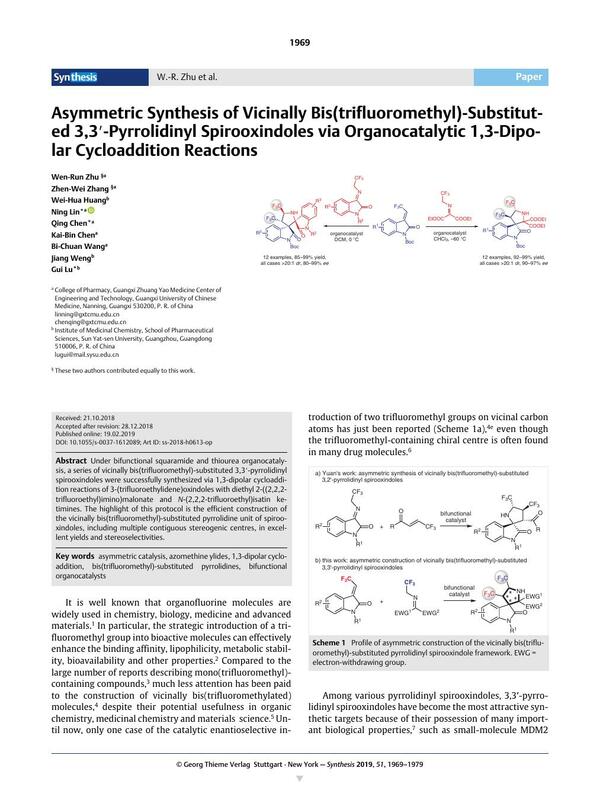 Under bifunctional squaramide and thiourea organocatalysis, a series of vicinally bis(trifluoromethyl)-substituted 3,3′-pyrrolidinyl spirooxindoles were successfully synthesized via 1,3-dipolar cycloaddition reactions of 3-(trifluoroethylidene)oxindoles with diethyl 2-((2,2,2-trifluoroethyl)imino)malonate and N-(2,2,2-trifluoroethyl)isatin ketimines. The highlight of this protocol is the efficient construction of the vicinally bis(trifluoromethyl)-substituted pyrrolidine unit of spirooxindoles, including multiple contiguous stereogenic centres, in excellent yields and stereoselectivities. Supporting information for this article is available online at https://doi.org/10.1055/s-0037-1612089. 18 See the Supporting Information for the optimization of reaction conditions. 19b 6b was prepared from 3b (Scheme 4). 20 CCDC 1851257 (3a), CCDC 1851258 (5e) and CCDC 1855690 (6b) contain the supplementary crystallographic data for this paper. The data can be obtained free of charge from The Cambridge Crystallographic Data Centre via www.ccdc.cam.ac.uk/getstructures.